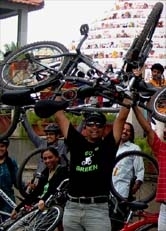 GoGreen Campaign Ride 18-jul-10 towards Cools Park.. - GGI-Group size: 4000+ Professionals, Increasing on day to day basis, Come & join us 2 serve Mother Nature. 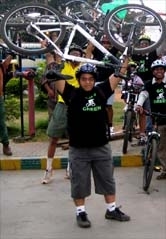 GoGreen Campaign Ride 18-jul-10 towards Cools Park.. 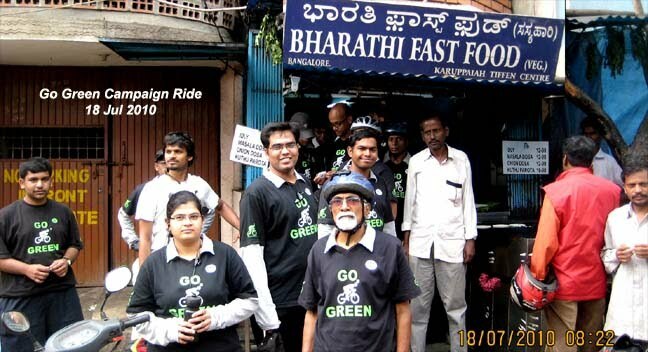 Totally 26 GGI's Participated on 18 July go Green Campaign Ride that started off from RIS junction @ 6:35am and reached Cubbon park by 7:05am. This time we were early by 15 minutes as we didn't had any new comers. 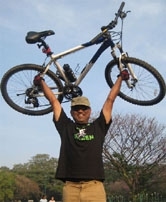 We had a Con call with our Major Srinivas who peddled down from Bangalore to Hydrabad, targeted 24Hrs of ride & set a record for himself but due to heavy rains in couple of places on his route forced him to take shelter intern lost 6 to 7 hrs. He has proved himself with the kind of endurance he has & Once again going to comeback. We Planned to Visit Coles Park hence started off @ 7:45am. visited a Church and then headed towards Commercial lanes and had breakfast and then dispersed. From RIS Junction : RIS Junction - Jaynagar 4th Block - Jaynagar 3rd block - South end Circle - VV Puram Circle- Minerva Circle - Hudson Circle - Cubbon Park - Central Library. From Cubbon-Park City Library : Vidhan Soudha - Cubbon Rd - Kamaraj Rd - Coles Park - St. Francis Xavier's Church. - Seppings Rd - Narayana Pillai-St - Bharat Fast Food - Comercial street.- Kamaraj Rd - Brigade Rd - Jhonson Market - Hosur Rd - Bannerghatta Rd - Mico Rear Gate - Dairy Circle - Jayadeva Flyover - Shopper Stop - JP Nagar. Breakfast Sponsored by Rajen JP Nagar..